Results are awesome. 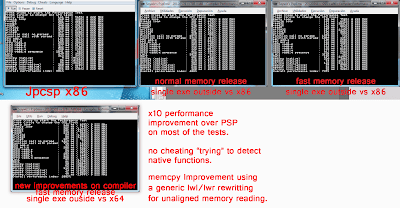 And make lot of compilerPerf tests 10x faster than a real PSP. 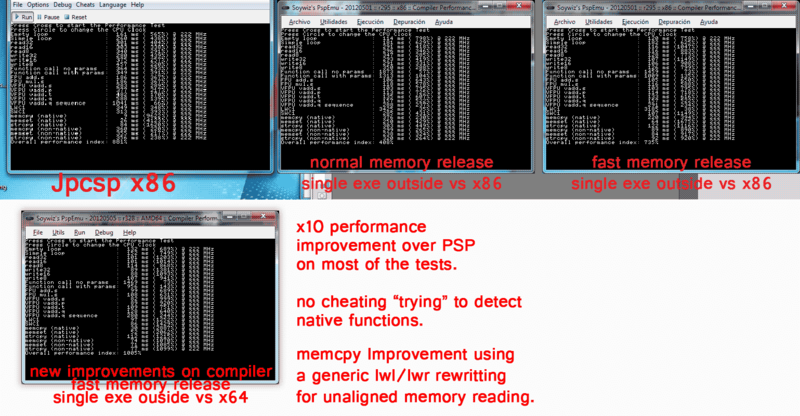 64-bits fixed the LWC1 performance problem on Intel platforms. I don't know waht most of these means but the LWCI dropped from 3000 to 97 from x86 to x64. But function calls still high. The lower the values before ms and the higher the % in the end means better results, am I right? The lower time, the better. The higher % the better. % is relative to the calculated for the real PSP. So 200% means its twice as fast as the PSP. Function calls are a part I have not optimized yet. But, step by step. It will take some time to get at the level of the great jpcsp. They made an awesome work. JVM doesn't allow direct unsafe access, so we are working on different approaches. C# allow to have an hybrid managed/unmanaged approach. And that's why I started this emulator. To get a cleaner, easier to understand and faster implementation. But jpcsp is still the most advanced PSP emulator at this point and in the near/middle-term future.